September’s cooler weather and continued long daylight hours makes it the perfect month for exploring outdoors. Discover how to use nature as your gym. These near autumn days are picture-perfect for outdoor adventuring. Leaves are starting to give landscapes an inviting golden glow, and your favourite parks and woodlands are quieter now that the children have gone back to school! Even with the somewhat unpredictable nature of the Great British weather, getting outside throughout the year can keep you healthier, happier and more motivated. Studies from the University of Innsbruck have even shown that the same activity can feel easier outside than indoors. 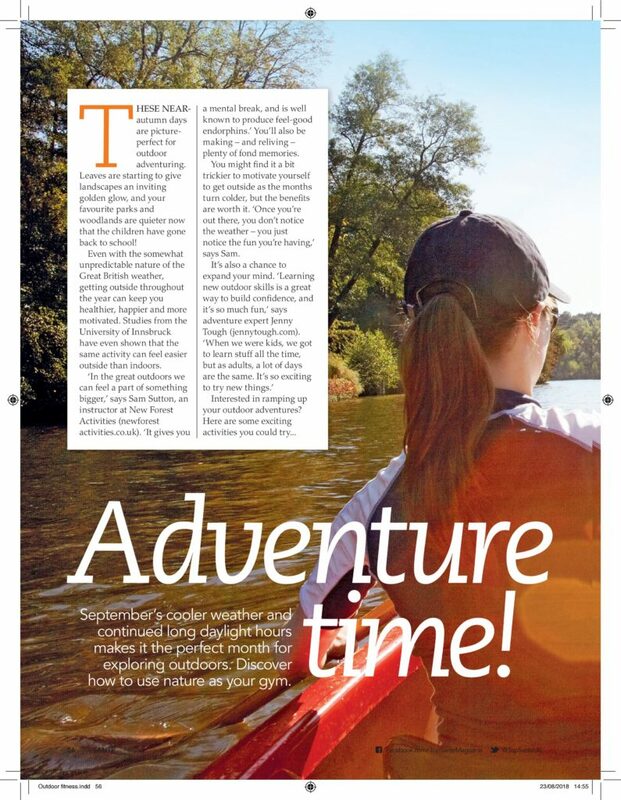 ‘In the great outdoors we can feel a part of something bigger,’ says Sam Sutton, an instructor at New Forest Activities (newforest activities.co.uk). ‘It gives you a mental break, and is well known to produce feel-good endorphins.’ You’ll also be making – and reliving – plenty of fond memories. You might find it a bit trickier to motivate yourself to get outside as the months turn colder, but the benefits are worth it. ‘Once you’re out there, you don’t notice the weather – you just notice the fun you’re having,’ says Sam. Canoeing and kayaking (canoeing uses a paddle with a blade at one end, while kayaking paddles are double-bladed) are two of the most natural and exhilarating ways to connect with your spirit of outdoor adventure. A session of canoeing or kayaking will help you burn fat; even a gentle paddle can burn up to 140 calories an hour. It also builds strength in your legs, back, shoulders and the muscles that rotate the torso. Canoeing and kayaking are intense but low-impact sports, so they’re kind on your joints and great for your bone health. ‘They are second only to swimming in the way they allow you to exert yourself without putting undue pressure on your body,’ says Sam. What’s more, both sports are fantastic for mental wellbeing and confidence – kayaking can lead to increased social skills and an overall boost in self-satisfaction, according to research published in the Journal of Leisurability. A session of archery will work to strengthen your arm, back and shoulder muscles, as you repeatedly lift the bow and draw the string. It also benefits your knee and hip joints as you walk back and forth and bend down to pick up your arrows. What’s more, if you’re feeling stressed in this hyper-connected age, you’re trying to increase your concentration and stamina at work, or you’re simply looking to find an accessible and alternative form of meditation, a spot of target practice might just be exactly what you need. After all, it seems that Robin Hood had his priorities pretty straight! Rope courses, a cross between an obstacle course and a climbing challenge, are very popular at the moment. While a session on a ropes course is likely to get you out of breath, they’re also a great way to build your self-esteem, improve your balance and develop your cognitive agility.